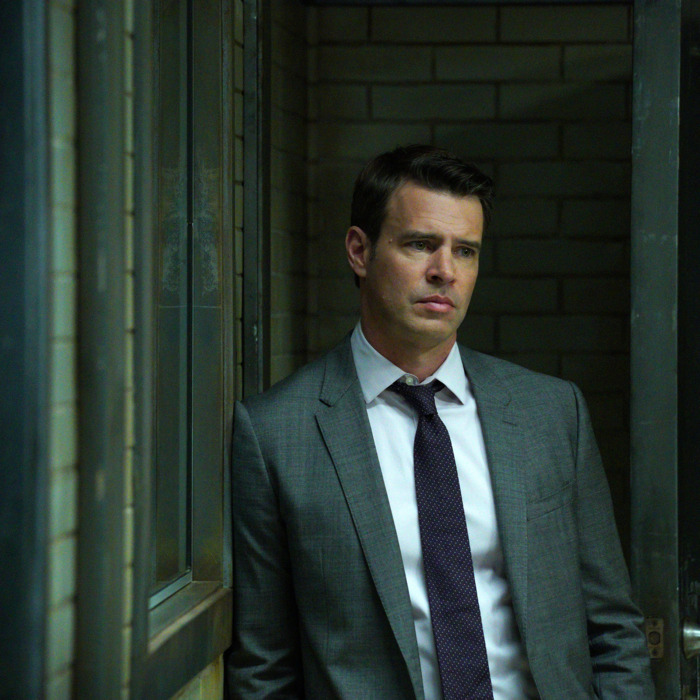 Scott Foley as Jake Ballard. It’s hard to believe that Scandal has never done a two-hour finale, given the show’s history of hyperbolic promos and Shonda Rhimes’s affinity for event episodes. Yet, until season six’s double-barreled conclusion, ABC has never broadcast two straight hours of Scandal. After watching “Tick Tock” and “Transfer of Power” with no breathing room between them, I understand why. Two hours of Scandal is a lot to absorb, especially in this season, which has gotten weirder and more convoluted with each episode. The deeper into the episodes I got, the more I wished “Head Games” had been the season finale, with its cliff-hanger setting up an epic confrontation with Mama Pope in the final season. But a measured pace is not Scandal’s jam, so instead of prolonging the reunion, Maya is taken into custody almost immediately in “Tick Tock.” Olivia, Jake, and Rowan hover in an adjoining observation room while she stews in an interrogation bunker. The goal? To figure out why Maya’s cabal is trying to hire someone to assassinate Mellie during her inauguration ceremony. If only because, like, you guys just assassinated a president-elect, and that’s not an outfit you can wear two days in a row. As Maya tries to rattle her captors, Khandi Alexander gets the kind of showy monologue usually reserved for Joe Morton, and she bites into it. Alexander throws herself into the scene with such gusto, it’s all the more disappointing that she can’t make the material fly. It’s not Alexander’s fault that Scandal has worn the Shakespearean Pope monologue down to the rind, but it’s gotten to the point that almost any episode that features Morton will build to a four-minute soliloquy where Rowan compares his success as a murderous spymaster to the African slave trade or something. Maya’s monologue is similarly big picture, suggesting Rowan’s treatment of her speaks broadly to the schism between black men and black women. But, y’know, most black women aren’t terrorists for hire, so let’s be fair. Just like in “Tick Tock,” Maya doesn’t play a huge part in the episode beyond the first third of the episode. Mellie defiantly goes forward with her public inauguration ceremony in spite of the threats on her life, and Maya is in the wind, having dug out her tracking chip. (Y’all must have forgotten when she chewed through her wrists. Removing a tracking chip is like pulling a piece of spinach out of her teeth.) Olivia gets a call from Maya while she’s on the inauguration dais, by which point Olivia and the gang have concluded that Maya is the assassin, not the client. Maya can’t take the shot unless Olivia moves out of the way, and Olivia refuses to move until Maya provides the name of the mastermind in her midst. Before Maya can take the shot, Rowan puts her down with a shot to the shoulder. Mellie and Fitz are ready to take a victory lap, having successfully transferred power from one Grant administration to the next. But Olivia can’t let go while the person behind the whole plot continues to evade justice. After a deduction montage, Olivia figures out that the person responsible for all of this is none other than Luna Vargas, the wife of Frankie Vargas and Mellie’s pick for vice-president. Look, Scandal has pulled off some pretty incredible twists in the past, but this one got away. There’s absolutely no way to make any of this track. First of all, where did Luna Vargas get billions of dollars to bankroll this operation? If Peus was working for her, why launch a drone attack to strike back after Luna is named vice-president? How would Luna know Mellie would draft her for the VP slot? Oh, there’s more. After Olivia and Jake corner Luna and force her to commit suicide, Olivia confronts Cyrus with the other part of her theory. Apparently Cyrus was the one who put the whole idea in Luna’s head. It was his grand scheme to get Frankie assassinated so she could rise in his stead and use her status as America’s widow to pass once-in-a-lifetime legislation. But he also somehow knew that Olivia would figure all that out and end up tapping him for the VP slot. Which, as I recall, he already occupied when the season began. I can’t even begin to untangle this nonsense, and it seems like Scandal was happy just to move on from the whole sordid Vargas affair. That’s fine by me. “Transfer of Power” does set up some really interesting ideas for the final season, as Scandal finally gives in to the idea of Olivia Pope as the bad guy. She’s always been a pretty terrible person convinced of her inherent goodness, but with Rowan and Maya as her parents, there’s no way she’d be able to wear the white hat indefinitely. Olivia had to give into the dark side, and she does so here in a big way, reanimating B-613 with a stroke of Mellie’s pen and installing herself as the head of the snake. Between her role in B-613 and the White House, Olivia is the most powerful person in the world. Cyrus asks how it feels. “It feels right,” Olivia says. Something tells me the new and improved OPA won’t let that power go unchecked.